This past month Saskatchewan experienced the coldest temperatures on record since the 1930s. With each day that the mercury in the thermometer fails to rise above -30, it becomes harder to leave the house and more attractive to nest in front of the television, wiling away the bitterly cold days with Netflix and video games. If you do manage to venture outside, the Dunlop Art Gallery’s Digital Lounge and Virtual Reality Station (formerly a reception and administrative space) offers a cozy den lit with the glow of monitors and stuffed with media art of all sorts. Among these is Montreal-based artist Pippin Barr’s dryly titled video game v r 3, a hybrid of tranquil beauty, simulacra, rarified gallery tropes, and crass commercialism. v r 3 continues the artist’s cheeky virtual recreations of Minimalist architecture and art explored in his previous video game projects v r 1 and v r 2. The stark precision of Minimalism (and Donald Judd’s aluminum boxes in particular) aligns perfectly with the default aesthetic of video games, where irregularity and texture demand significant time and file-sizes. 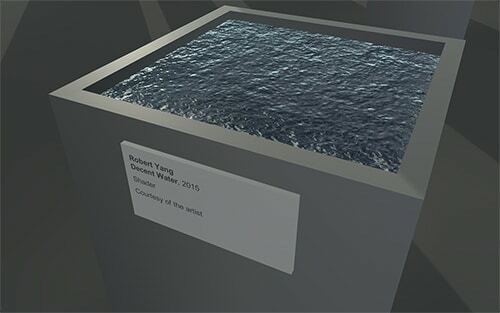 In v r 3 the player/viewer navigates two austere gallery spaces dotted at regular intervals with plinths capped with jewel-like squares – 48 water shaders purchased from the Unity game engine store. Familiar rectangular placards stating “Utopiaworx, Hard Water, 2016, shader, $4.99” underscore the technical and artistic labour behind each digital ready-made. Grey and creased like a crumpled piece of paper, jagged turquoise spikes, softly merging gold-tinged globs, and smooth onyx: this collection astounds with its diversity, beauty, and cheapness. The waters of v r 3 are impervious to time, yet ever-changing. While the world’s oceans acidify and desalinate, these virtual waters will forever send squiggles of light darting across their rippling surfaces. v r 3 is a delightful game, though I suspect it’s one that Barr himself is playing with the conventions of the art world. And if you’re not equipped to plunge into the cold before March 22, it’s also available as a free download. Pippin Barr: v r 3 continues until March 22. Sandee Moore is a nationally exhibited artist, arts administrator, and occasional art writer. She can be followed on Twitter @SandeeMoore.